The petals may have dropped from the cherry trees, at least in the Tokyo area, but there are plenty of leaves to be seen — and not just on the trees. 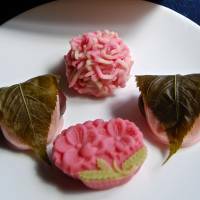 Look around any shop selling traditional wagashi sweets at this time of year and you’ll find cherry leaves in evidence, wrapped around sakura-mochi. Nibbling on these pink-tinged confections is one of the classic rites of spring. It’s easy to identify them by the salt-preserved cherry leaves wrapped around the outside. But, as so often in Japan, there is an east-west divide on what’s supposed to go inside. In Kansai in the west, small dumplings are formed from steamed dōmyōjiko (sticky mochi rice flour) stuffed with red-bean jam. The eastern, Kanto style, by contrast, calls for the core of smooth sweet-bean paste to be folded inside a miniature pancake made of shiratamako, another kind of mochi rice flour. That is the kind you’ll find at Toraya. 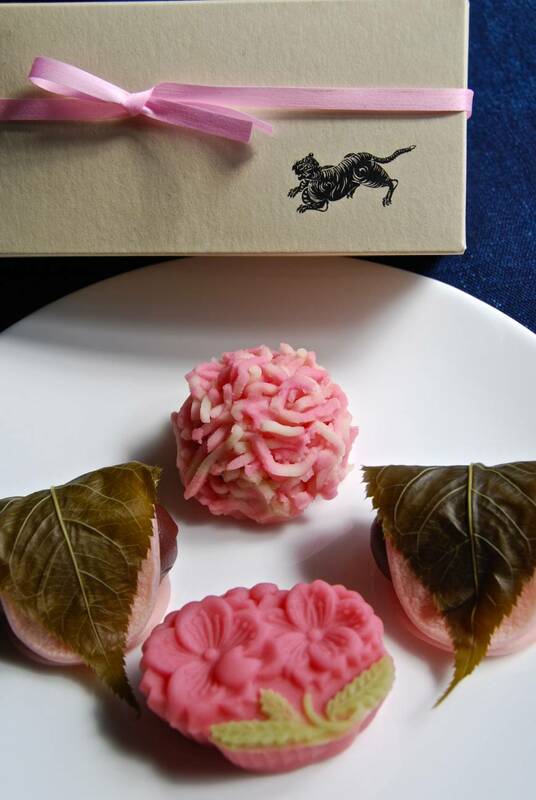 One of the most venerable wagashiya in all Japan, Toraya has been making this style of sakura-mochi since 1918. Its Akasaka HQ is a place of pilgrimage for any foodie whose sweet tooth has a traditional slant. But those with an eye for interior design should also check out the impressive branch on the basement floor of Tokyo Midtown. From the outside, all you see is the three-quarter-length noren curtain that covers the entire shop entrance, obscuring everything inside bar the legs of the display tables. Push through that curtain, and you find much of the display space at this time of year devoted to sakura-mochi and other fresh confections with cherry motifs. Like the evanescent blossoms, Toraya’s sakura-mochi season is fleeting. In Tokyo, it will last through April 15 (in Kansai, it’s already over). But, as with nature, that only means the next theme is ready to start. Stand by for kashiwa (oak leaf) and green sasa (bamboo grass) mochi. Right next door to Toraya’s Midtown store, another high-end confectioner has been holding a seasonal display of a rather different kind. 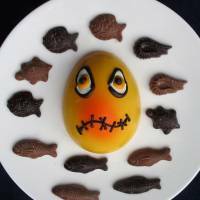 Chocolatier Jean-Paul Hévin marked Easter this year with some very unconventional eggs. 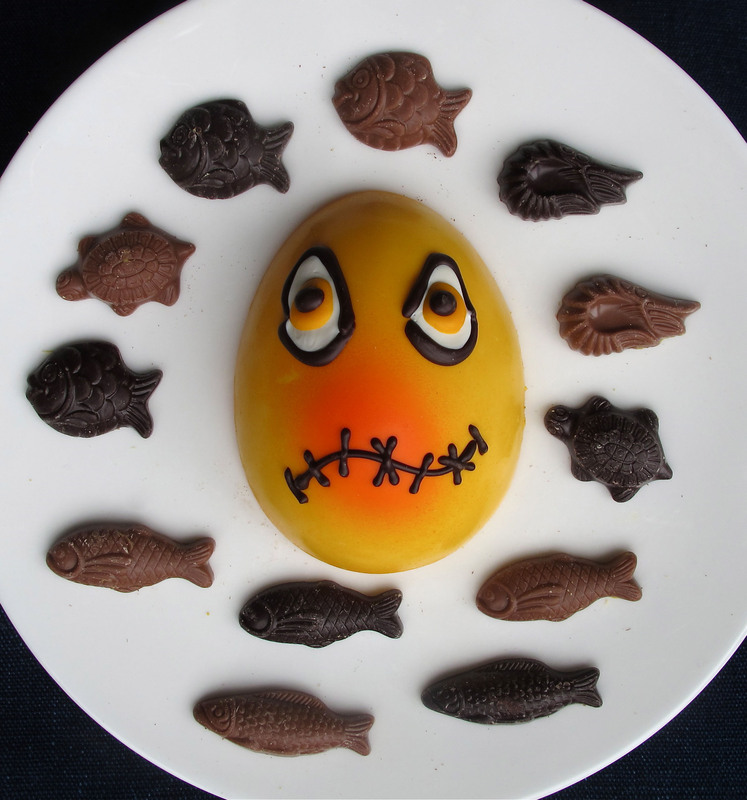 Made with bright, near-primary colors, they have big, sad google-eyes and mouths that look like they’ve been stitched shut, and are stuffed with small, one-bite chocolates in the shape of sea creatures such as fish, prawns and turtles. What does it mean? Who knows, but they’ll be available for another 10 days or so. Meanwhile, down in Ginza, fans of traditional drama are celebrating the resurrection of the storied Kabukiza theater. Why not mark its rebirth with a limited-edition éclair? Produced by the confectioner Fauchon, these Eclairs Kabuki are decorated in stripes of black, yellow and green icing — the same colors as the curtains that grace the stage inside. They’re on sale from a pop-up boutique in the basement of the new Kabukiza tower — but move fast, as they’ll only be there a few more days (through April 7). After that, the options will be more traditional: monaka ice creams, kabuki ningyō-yaki and other Japanese sweets.